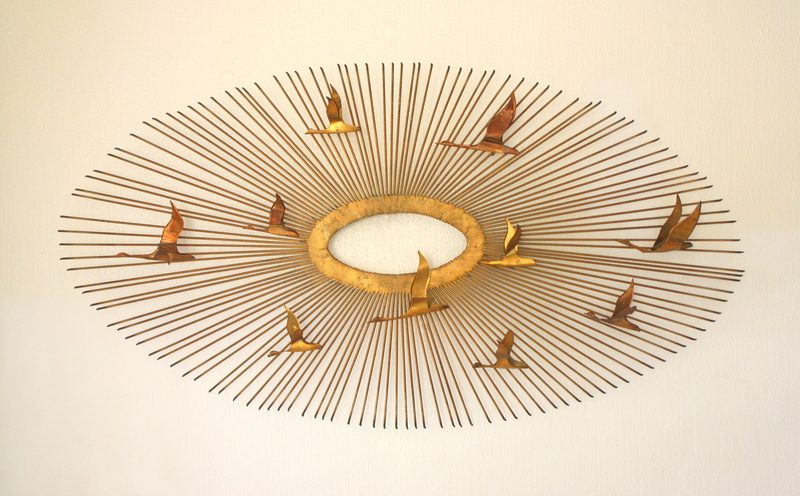 This is a mid century modern Curtis Jere style Brutalist sculpture wall hanging of a sunburst with flocking birds. Dimensions: 38″W x 20″H. This is a mid century modern Brutalist sculpture wall hanging of butterflies. Dimensions: 8.5″W x 4″D x 30″H. These are 2 mid century modern Brutalist cattail sculptures. 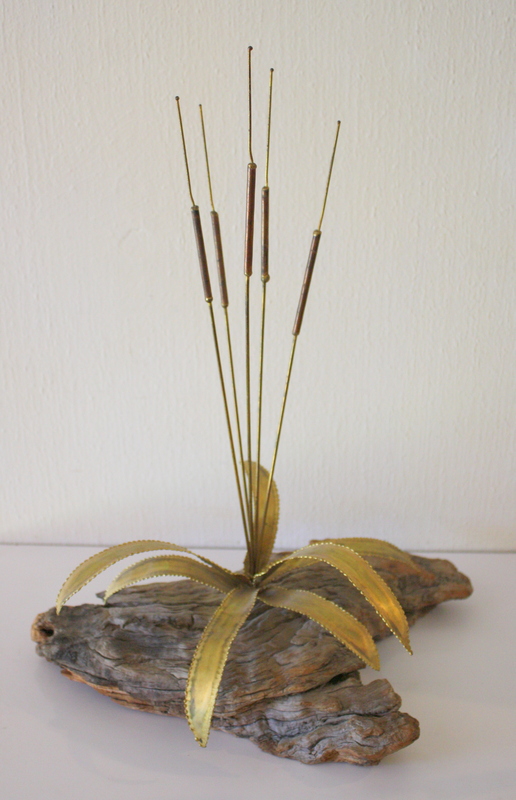 The first is a petite sculpture of metal cattails, set in a block of cork. Dimensions: 8.5″W x 4.5″D x 22″H. 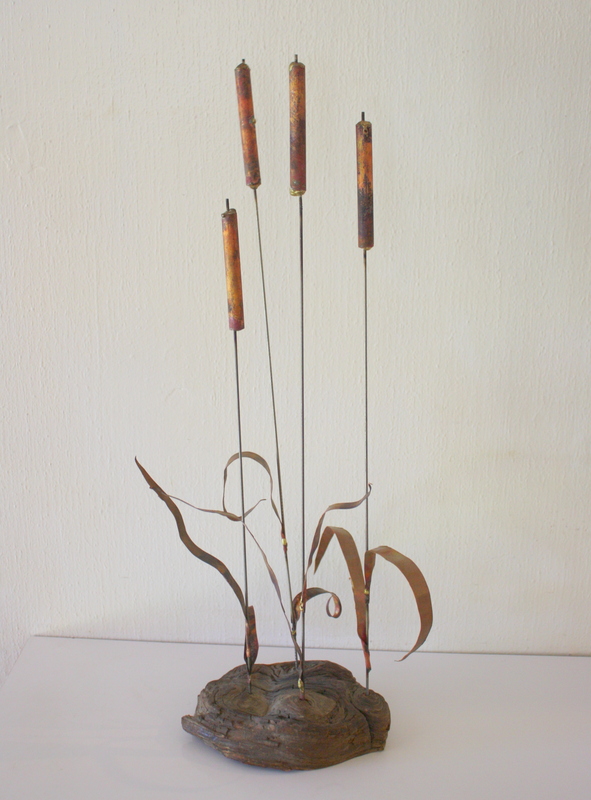 The second is a larger sculpture of metal cattails, set in wood. Dimensions: 13″W x 5″D x 27″H. This is a mid century modern Curtis Jere style Brutalist sculpture wall hanging. The brass sunburst with birds brilliantly displays the sun’s rays. Dimensions: 38″ x 20″. This is a mid century modern Brutalist art sculpture of flowers in a vase. The flowers are welded metal, and the base is solid wood. Dimensions: 3.5″W x 3.5″D x 30″H. 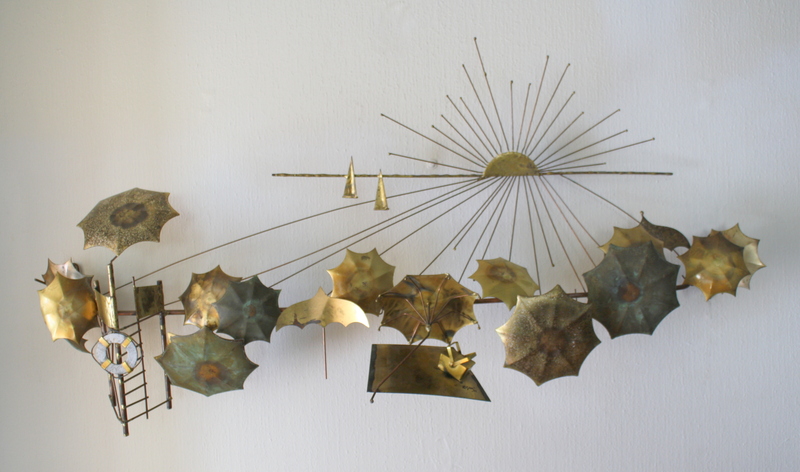 These are 2 mid century modern Curtis Jere style Brutalist sculptures of sunbursts with birds. Can be sold as a pair or separately. Dimensions: 10″ diameter. Both Brutalist sunbursts are sold. This is a mid century modern metal baby owl sculpture in the Brutalist style. Dimensions: 8″W x 6″D x 7″H. This is a mid century modern Brutalist wall hanging sculpture art piece. It is a flock of birds in a mixed metal finish: 36″W x 5″D x 12″H. 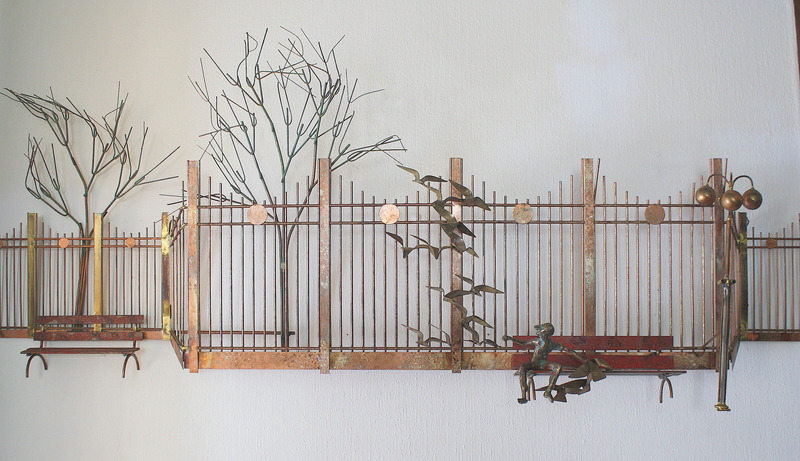 This is a mid century modern Brutalist wall hanging sculpture art piece of a bridge sculpture with sailboats and birds: 30″W x 1″D x 14″H. 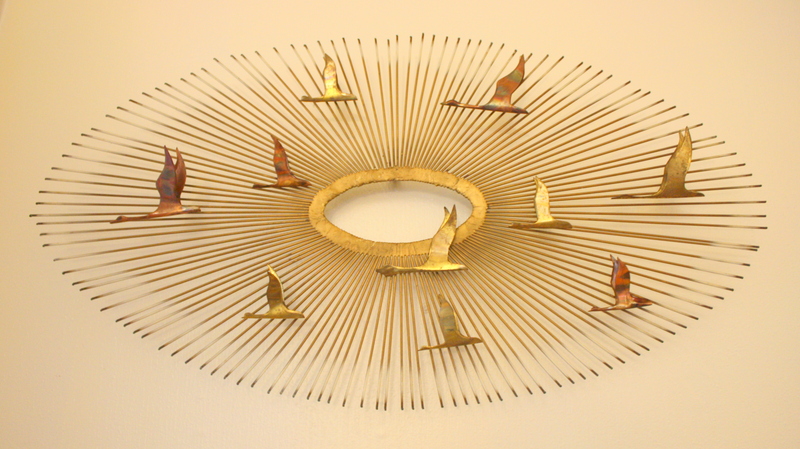 This is a mid century modern Brutalist brass sculpture wall hanging of a sunburst with birds that brilliantly displays the sun’s rays. Dimensions: 38″ x 20″. This is a mid century modern Brutalist owl sculpture set in stone. Dimensions: 12″W x 3″D x 13.5″H. This is a mid century modern Brutalist wall sculpture in brass. It has a geometric shape design and is sculpted in brass. Dimensions” 32″W x 2″D x 32″H. These are 2 mid century modern Brutalist wall hanging sculpture art pieces by Curtis Jere. The first is a signed beach scene: 36″W x 5″D x 17″H. The second is a signed park scene: 49″W x 6.5″D x 21.5″H. Both Curtis Jere scenes are sold. These are 2 mid century modern Brutalist brass sculptures of a sunburst with birds that brilliantly displays the sun’s rays. The first sunburst has a solid brass look. The second sunburst is also solid brass with a highlighted edge. Click on each picture for subtle difference. Dimensions: 38″ x 20″. This is a selection of mid century modern Brutalist sculpture art pieces. The first is a river reed Brutalist sculpture of brass in burl: 7″W x 5.5″D x 24″H. 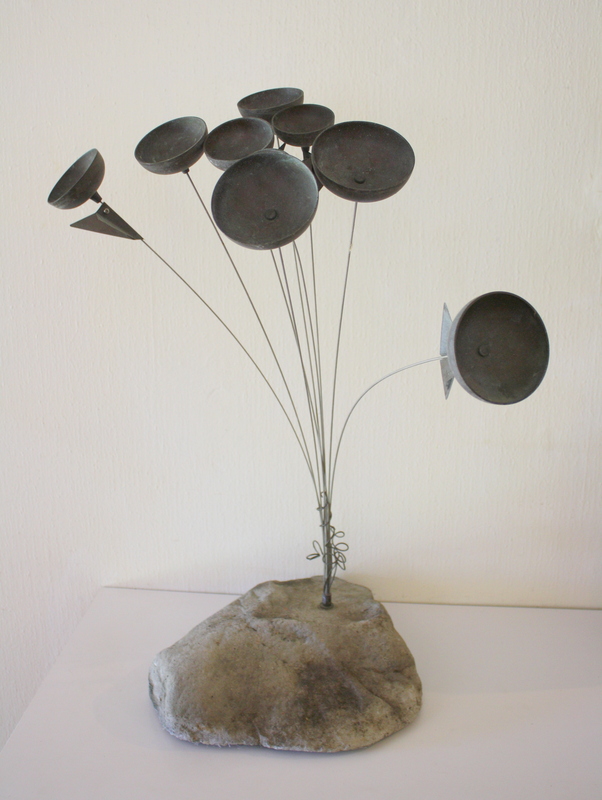 The second is a Brutalist flower chime sculpture in stone: 13″W x 10″D x 24.5″H. The third is a river reed Brutalist sculpture of brass in burl: 13″W x 9″D x 17.5″H. All Brutalist sculptures are sold. This is a pair of mid century modern side end tables with a Brutalist design. They are solid wood sculpted tables with glass tops and tapered legs. 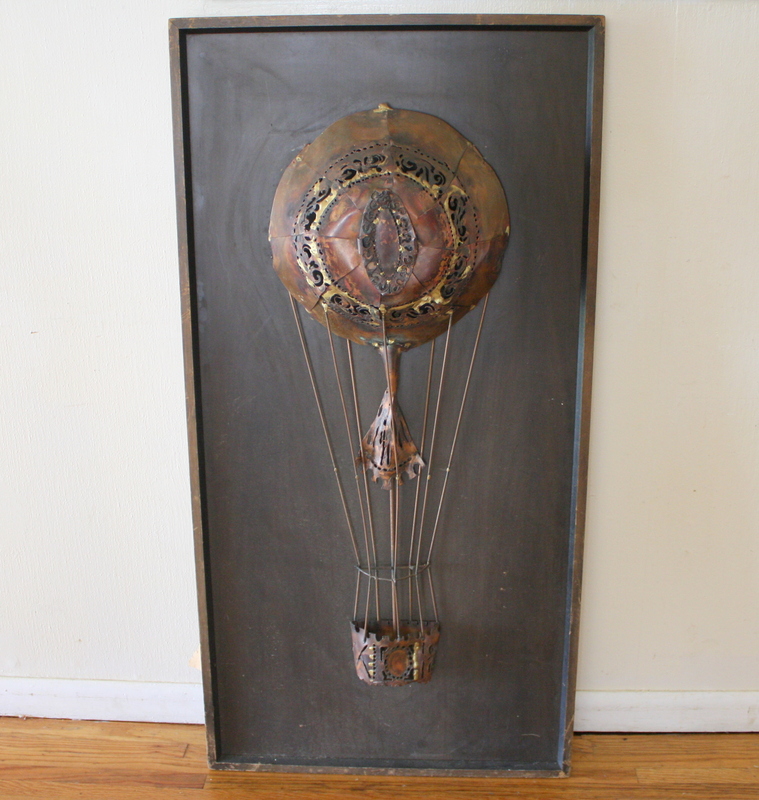 This is a mid century modern Brutalist wall hanging of a hot air balloon. The metal balloon is mounted on a wooden back and frame. Dimensions: 25″W x 6″D x 49″H. 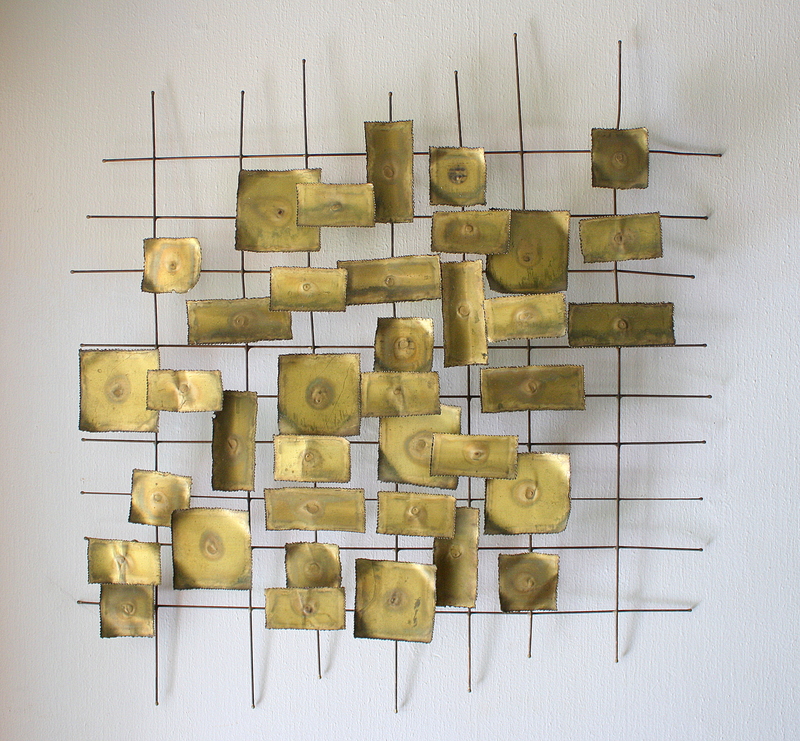 This is a mid century modern brutalist wall hanging made of brass. It has a sunburst design with birds in flight.